Elaine Adair Pieces: "Determination", almost finished! I've showed bits and pieces of Orca Bay, now called "Determination", over the last few months - this project went on for a long time - I'm guessing there are well over 3000 pieces in this baby! 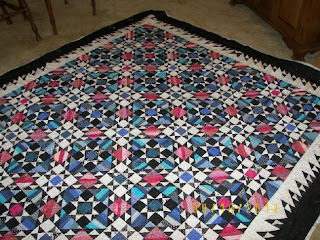 It was started as a Mystery, from Quiltville.com, after Christmas, January 2012. The top went together quickly, but then I couldn't decide how to quilt it, especially wanting to emphasize the diagonal lines. Here it is, so far. I have the borders to finish, then the binding. There is a LOT of quilting on this project. 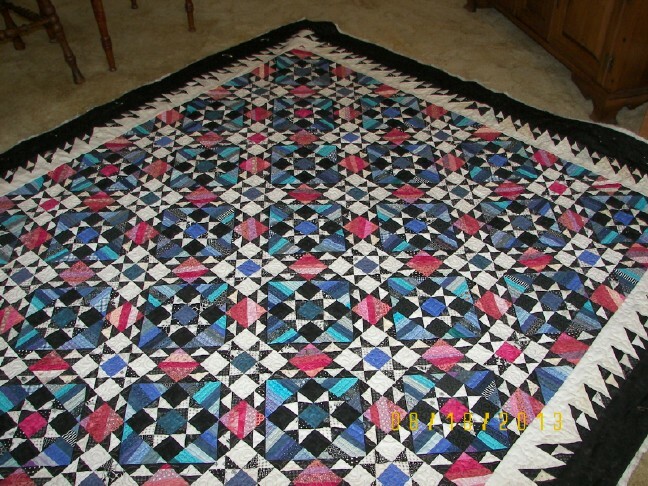 The "light" is done in a pale variegated pink - a LOT of quilting, and the dark stars are quilting in dark blue, a simple continuous curving lines around the stars points and through the center. That outer border is a black marble - less dramatic than pure black. The Backing is a medium dark blue, and I used a variegated blue thread in the bobbin. The border went together so well - a miracle! Thanks Bonnie Hunter! Here is a corner and part of the quilting - a curvy loopy line/vine, that swerved into the large white triangle with a heart-chaped leaf. I'm getting close to DONE! Oh Elaine, I'm so proud of you!!!! You are really making this quilt happen by sheer will-power. My own Orca Bay still languishes in three different baskets full of "parts". Maybe this winter I will get back to it. Yours is surely inspiring! OH, it is gorgeous!! Mine still isn't bound...love yours so much, and love your determination! I love the way you are pointing the leaves into the triangle. Looks wonderful! Hooray! 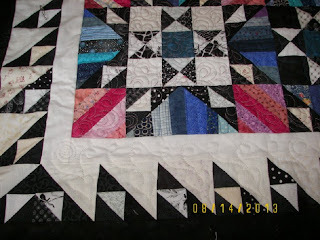 Mine still needs the border, not to mention quilting it yet. Wow, what a big project. I bet you'll be glad to see this one completed and ready to snuggle under. Very nicely done. Mine is in the flimsy stage and I hodgepodged the border, but done is better than perfect for me on this one. I did better on Easy Street. Good Glory! What a quilt! I close my eyes for a month and look what you've done! 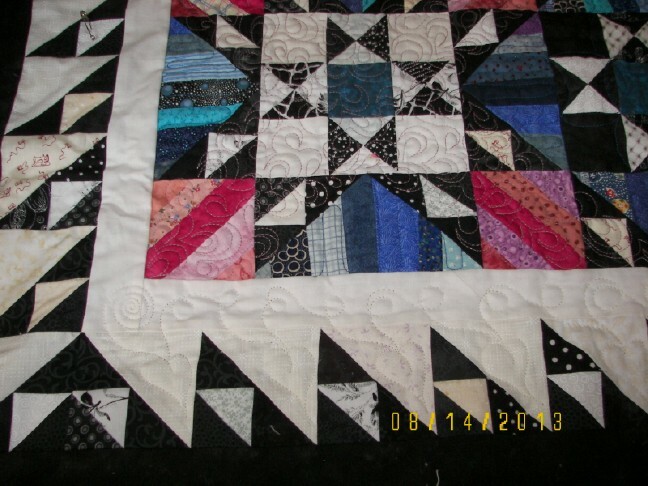 I clicked on the pictures to see the quilting in more detail. Great idea to put those leaves in the triangles of your border! That's an amazing quilt to be doing in your machine! It looks fabulous, darling. Great quilting too. Congrats on the finish. Just catching up! Yours s wonderful! This quilt is n my to do list..... Someday! Bonnie's quilts can sometimes be a test of sheer willpower, but I do love them! I finished her Easy Street and am working on her Lazy Sunday now. My Orca Bay is still under construction. Kudos on a beautiful quilt!